In the basement of the Mount Horeb Historical Society, there sits a rocking kubbestol. Covered in cloth and placed in a poorly lit room, it is hidden to those who do not know about it. To study the chair in this room, two people must pull it out slightly, so it can sit in the dim light. The kubbestol’s weight is unbelievably heavy and that is why it sits below the museum during construction. It cannot be moved across the street with the rest of the collection. It demands to stay one place. Observing the kubbestol rocker, the details come to life. There are scars covering the chair, details from carving out the giant log with an axe. There is paint on the end of the seat worn away from use. There is rosemaling along the bottom of the chair, large and swooping. There are two horseshoes carvings on either side of the chair, easily scanned over to study the rest of the object. A large crack traces the left side of the chair, showing the wood expanding with age, stretching out and making its presence known. Then there are the rockers. How did they come to be on this kubbestol? This powerful, heavy mass of a chair seems like it would smash the rockers into the ground. This beast of a chair could not possibly move the way the rockers imply. Who thought this was a good idea? Marrying this uprooted tree to such a fluid, calming idea of a rocking chair seems ridiculous and yet it is perfect for this exhibit. Mount Horeb was a community of immigrants that wanted to pass their culture down to their future generations and they clearly succeeded when you look around the Historical Society. However, this Norwegian culture does not remain untouched. Children of these immigrants not only cared for their Norwegian roots, but they also wanted to grasp the shifting nature of American culture. By placing rockers on a kubbestol, they create a cultural hybrid of their idealized identities. Both the rocking chair and the kubbestol are symbols of the nostalgia that is a focal point at Little Norway. By combing these two chairs, this object highlights an equally prevalent theme of reinvention and cultural fusion of Norwegian-American immigrants. In this essay, I will explain the history of the object specifically, but also the histories of kubbestols and rocking chairs generally, so a wider picture can be analyzed. This will all help elaborate what this object could mean for Mt. Horeb and even Norwegian immigrant culture. To start with the object itself, we must start with Little Norway. In 1926, Isak Dahle, a Chicago businessman, began creating Little Norway, or “Nissedahl,” (the valley of the elves). This place was meant to preserve “a typical pioneer farmstead settled by Norwegian immigrants.” It included sod-roofed outbuildings, a hunting lodge, a summer cottage, and the stave church. In fact, the church, modeled after a 12th century Stavkirke and made in 1856, was used for Norway’s display at the Columbian Exposition in 1893. The buildings were meant to look as though they were authentic to the time period and some, like the church, were. However, Dahle had to commission many workers to create the furnishings. Little Norway was heavily romanticized and many articles and stories about the destination discussed elves, the Norwegian royal family, and wonderland. Some even said, “The furnishings are so realistic that one almost wonders whether, perhaps, the family has not simply gone away for an afternoon to visit neighbors down the road.” It seemed as though associating magic and wonder is second nature to the area. Nevertheless, it was idealized for good reason: thousands and thousands of visitors would visit the southwest Wisconsin attraction. This is a hugely important discovery, because the book shows how the rocking kubbestol was displayed. It tells us about where it sat at Little Norway and whether or not it was used. 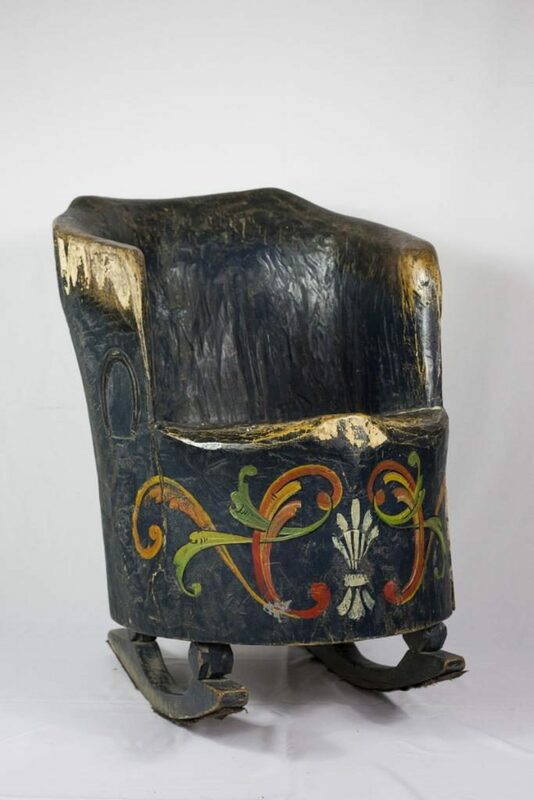 The object itself also tells us that the black paint has been rubbing off from use, could patrons have been allowed to sit in the chair and really experience a Norwegian-American life? Through another brochure, the chair is found and it states that, “The furnishings in the dining room make one marvel at the ingenuity of the Norse pioneers, who could create such handsome things with whatever was at hand. There are two beautifully rosemaled kubbe-stols, one made from a hollow log with the seat fitted in, and the other a solid log with rockers added.” Within this same section, the writers claim, “it would not be hard to believe, in the peaceful, Old World atmosphere of this almost enchanted spot,” though this idea is complicated when you dwell on the fact that this chair was created for Little Norway. The rocking kubbestol was probably made between 1927 and 1930 and carved from an oak tree. According to the catalog notes, the chair was, “based on the Norwegian kubbestol chair,” and it was crafted by one of the Norwegian workers who helped to build Little Norway. Which one? After digging through the archives, there is no solid conclusion. However, there are hints as to whether this piece is unique or not. Dr. J. H. Lee of this city, a Norwegian doctor, used to live at Iola, Wisconsin, not far from Amherst. When he came to Madison some years ago, he brought with him a Norwegian chair made of one piece of wood, and rounded off at the bottom so that it could be used as a rocker. It was made by a man in or near Iola. If you are interested in this sort of thing, I shall make further inquiry about the matter, as I have friends in Iola, whom I visit every summer. After this letter, Emma L. Lee continues to write Isak Dahle, but there is no mention of the rocking kubbestol. Could it have existed? Was this Dahle’s inspiration? Why isn’t this design mentioned anywhere else? The design that truly makes sense on the chair is the rosemaling. This is one of the most distinct features of the chair and it is extremely common for both the time and the history of kubbestols and Norway. Olaf Colberson, a folk artist with a tragic past, most likely decorated the piece. His wife institutionalized him unwillingly and stole his money. Luckily, the community rallied together and got him released from Mendota Mental Health Institute. He was accepted back into the community with open arms and both the townsfolk and even the governor celebrated his artwork. His story alone would make the chair an interesting piece, but there is a more pressing question: why put rockers on a kubbestol? Before we delve in to talking about specific types of chairs, the idea of the chair as an object to be studied must be discussed. Material culture is a growing field that analyzes culture through material objects. By studying things, we can better understand history and culture, because we can see what people value, use, and create across time. Often, chairs are considered utilitarian above all other characteristics. We need them for an easy way to sit down, we need them to sit at the table, we need them in crowded theaters, and we prefer different styles based on our comfort needs. However, chairs represent much more than a resting position. They communicate our identity and our lifestyle. Think of a rocking chair, a stool, and an office chair. These are clearly not interchangeable, but they all chairs and it matters which one you are sitting in. According to Galen Cranz, chairs are, “a culturally-loaded symbol which helped to express our attitudes, aspirations, and identity: it communicates to others our chosen ‘lifestyle’” (67). How the chair is styled is important. If you wanted to be taken seriously, you would not chose a beanbag chair to sit on. You would want something like an office chair and, almost as important, a chair that fits the environment around it. How the chair looks represents not only the owner, but also anyone who choses to sit in it. Cranz states that, “interest in the look of a chair means that some people become enthralled with connoisseurship—knowing which ones are the more authentic expressions of a type and why,” which fits into the idea of whether or not the rocking kubbestol being an authentic piece (67). Studying the kubbestol and rocking chair separately will honor the idea that these two chairs come from different cultures and must be analyzed independent from the other before scrutinizing the paradox of this combination. When you sit in a kubbestol, you are rooted to the ground. There are many different designs and sizes for each kubbestol created, but they all share one thing in common: stability. This Norwegian chair demands its presence be felt. Representing power, the kubbestol is an immovable piece with a proud sense of self. These chairs are created from the trunk of a tree, carving the trunk with an axe. They are typically designed with birch, as it is abundant and easy to work with (keep in mind the rocking kubbestol is made of oak, a heavy, sturdy wood). Sometimes, they are hollowed out to make the chair slightly easier to move. The cross-section seat on most kubbestols exposes the kind of tree that was cut and how old it was. Why make a chair that is so similar to a tree? Both Norway and southeast Wisconsin have an abundance of trees. Forestry is a huge market, but, more than that, Norwegian folklore is constantly surrounded by the intersections of human and nature. Trolls and magic are abound in these stories and the newspapers might not be off when they describe Little Norway as a kind of wonderland. Calling back to the caption of the rocking kubbestol I quoted, kubbestols were extremely popular in 18th and 19th century peasant homes. Elaborate designs of kubbestols date back to the 12th century. When the rockers aren’t taken into account, this simply designed kubbestol would easily fit into the peasant home that Dahle created at Little Norway. These chairs aren’t made often, anymore, but they still call back a sense of nostalgia for the “fatherland,” as Dahle put it. Making these kinds of chairs emphasizes the longing of the immigrant for their original home. This longing is passed down, but it is also a celebration and a reminder of where they come from. The rocking chair doesn’t share this history, but it does share the nostalgia. Rocking chairs date back to the early 18th century in America, though some credit the invention to Benjamin Franklin. In its early days, rockers were merely attached to regular chairs, but, by 1860, the German craftsman Michael Thonet created the first bentwood rocker. This meant that the design was much easier to rock on and much lighter, because bentwood creates one curved piece of wood. Their chief virtue from a somatic point of view, is that they move the ankle, knees, and hip sockets directly, and the head-neck joint and the entire spine only slightly less directly. In addition, rockers usually offer appropriate support to the shoulder, neck, and head because they often have high backs. Seat height does not go up and down so much as it pivots around an invisible axis, part of how rockers allow for internal adjustments kinesthetically. How gratifying to find that rocking chairs exemplify a kind of comfort that accommodates the body, yet is not so enervating as to induce slumping and drowsing. Everyone should have one. The historian David Hanks says rocking chairs were the most comfortable chair of their time when they were introduced. This chair is the epitome of comfort. Even going through the Furniture: Made in America 1875-1905 Price Guide, the log rocker is a clear winner in comfort. Nothing compares to this cozy, lazy chair, because everything was sharp lines, no cushions, no movement. You couldn’t even lean back slightly in any of the other chairs. Rockers connote soothing infants, being in a bassinet, being on a porch in the middle of summer, American nostalgia. The kubbestol and the rocking chair share two major characteristics: they are chairs and they are fixated on nostalgia. One touches on the “fatherland,” and the other on the American Dream. The dance around this idea of the American Melting Pot, where cultures and ethnicities are poured into one country, is nothing new, but the prospect of seeing it so clearly in something as simple as a chair can feel astounding. That being said, by studying the two different kinds of chairs, the paradox of the rocking kubbestol is made apparent. Although the chair reaches back to nostalgia for both Norwegian and American culture, there are clear incongruities in the piece. Kubbestols are rooted to the ground and they represent power. The rocking kubbestol couldn’t even move out of the basement for construction. It wanted to stay, so it stayed. Rocking chairs are specifically designed to move and sway with the person who is sitting in the chair. The goal of a chair is to constantly make itself more and more efficient and light. The chair doesn’t represent power, even if JFK used it, it represents relaxing after a hard day’s work. The combination of the two chairs simply doesn’t belong. And yet it is still here. Immigrants didn’t make the rocking kubbestol, but their descendants did. The idea of reinvention, of combining two drastically different parts of your culture and your identity to create something new and entirely your own is one of the most important things about Mount Horeb. Everyone in the town of Mount Horeb, even the visitors, feel a sense of nostalgia for what it was like to live there—be it Norway or the 18th century. However, the idea of just being nostalgic rings false. It’s not just about wishing you could be somewhere or someone else, it is about having and creating a distinctive culture. Wanted to participate in American culture, like the rockers, shouldn’t matter. Accusations of wanting to assimilate are a big deal, but the creators of this chair made that argument nearly impossible, anyway. Placing rockers on a kubbestol isn’t assimilation, it’s reinvention. Both sides of the self are important. Both sides of the self are invested in best representing identity. The chair is confusing and there are no distinctive lines (or there are too many lines) to understand what was going on in the head of the creator. However, the rocking kubbestol perfectly aligns with what the reinvention of American culture. Little Norway’s main purpose, was that it “should serve as a haven and preserve the arts and crafts of the fatherland, and that it also served as a tribute to those whose study sons and daughters faced the terrific hardships of making a future in the land of promise…” and it clearly has. Little Norway ended up closing its doors, but the Mount Horeb Historical Society generously picked it up. The strength of the collection is only matched by the strength of the community, no matter how messy certain objects seem to be. The rocking kubbestol lives in a paradox, but it really is the best way to describe Mount Horeb’s community. The Norwegian culture is everywhere and yet, it’s updated. It’s rockers on a kubbestol, it’s rosemaling hot pink pumps. It’s reclaiming history and forging a path forward. With each new generation, more people will be able to see this special town. And this town will evolve into something greater than nostalgia for a different location or different time, it will evolve into a flourishing, merged, Norwegian-American identity. Creators, Collectors & Communities by by Laura Schmidt is licensed under a Creative Commons Attribution 4.0 International License, except where otherwise noted.